Police Investigate Man Shouting 'Why Don't You Die?' Find Dead Spider. Spiders are scary. It doesn't matter that some aren't dangerous: We have a highly deloped fear response to them for a reason. Just trust yourself, and freak out. That being said, you can take it too far, like this Australian guy did. On New Year's Day, police were summoned to a house in Perth by a concerned neighbor who heard a screaming toddler and a man shouting, "Why don't you die? ", the BBC reports. Naturally, this caused concern. 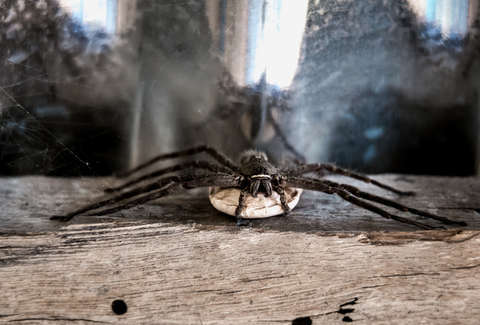 Several police officers responded to the scene, complete with lights and sirens, and found a man with a "serious fear” of spiders, trying to kill a spider. Luckily, though, the screenshots have been preserved in other tweets like the one above, so we can witness for ourselves the hilarity of police reporting that there were "NO INJURIES SIGHTED (EXCEPT TO SPIDER)." The moral is, you should absolutely be terrified by spiders -- but show a tiny bit of restraint.